George was born in Sherborne, Dorset in 1880 the son of Ellis John Edwards and his wife Elizabeth (née Dunning). He was the third son, fourth of six children and the only last to be born in Sherborne; his parents moved around as Ellis moved from job to job. In 1881 he was a servant/butler then, in 1891, a labourer and boiler maker before taking the role of sub-postmaster (and caretaker and gardener) ca 1899. 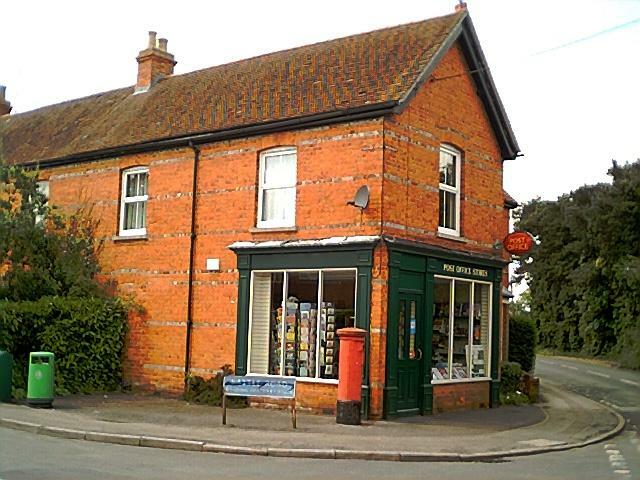 Prior to this the sub-post office at Wash Common was on the east side of the Andover Road between Monk’s Lane and Park Lane; when Ellis took over the job he established the new post office in his house on the corner of Battle Road and Essex Street (though Battle Road did not exist at that date). There is no evidence that George ever lived in Newbury, by the time of the 1901 census he was 20 and not living with his parents. Sadly his census entry for that year has not been found. By the next census in 1911 he is living in Watford, Herts, as a boarder with the Goulborn family in Denmark Road. His occupation is given as ‘manager, boot trade’; in fact he was branch manager of the local Freeman, Hardy & Willis store with whom he spent a total of 23 years, managing the Watford branch for 12 years. Badge of 7th London Regiment on George's grave in Belgium. On 1 May 1916 George joined the 7th London Regiment, a territorial battalion (London Regiment battalions all took the name ‘regiment’ even though they were really only battalions of the overall regiment). His number was initially 8272 then changed to 354390 when the Territorial Battalions were renumbered in early 1917. He joined under the Derby Scheme, a precursor to full conscription named after the Minister for Recruitment, Lord Derby, who introduced a scheme that encouraged men to register for enlistment at a later date (as and when required). Final registration for the scheme was in December 1915 after which men were called up in batches dependent on age and marital status. As a single 35 year old George’s name came up relatively soon, but not in the first batches. Following his training he would probably have joined the regiment on the Western Front as part of a draft of reinforcements to the 1st/7th London Regiment. In early June 1917 the 1st/7th took part in the Battle of Messines as part of the 47th (2nd London) Division. This assault on the enemy lines ended on 13 June. The Division would then have been involved in the day to day ativities of life on the front, periods manning the line, periods of rest, and periods of behind the lines activity (training, trench maintenance etc). Throughout this there would still be casualties from enemy shelling, sniping, or from raids mounted by either side. It seems that George, and two comrades (Ptes Lester and Russell), were victims of shellfire, ironically as his Company was leaving the front line for a period of rest. His younger brother Russell was serving with the same battalion and was able to let his parents know the bad news before they were notified through official channels. It is officially reported that Pte George Edwards, son of Mr and Mrs E J Edwards, of Wash Common, was killed in action on July 4th. He joined the 7th London Regt on the 1st May, 1916, under the Derby Scheme, trained at Richmond Park and from there to Salisbury Plain, going out to France the last week in October. He had 48 hours leave before leaving for France, none since. His last letter was received on the first, date June 27th, and he met his death with two others, by a bursting shell, on leaving the line for the rest-camp, death being instantaneous. He was 36 years of age, and formerly employed by Messrs Freeman Hardy and Willis for 23 years, being manager of their branch at Watford for 12 years. His brother, of the PO of Newbury, was in the same regiment with him, and sent home the melancholy news to his parents. They were quite noted in the regiment as being the most devoted brothers. A message of sympathy has been sent by the King and Queen. All three victims were buried in Ridge Wood Military Cemetery, south west of Ieper (Ypres) in Belgium. George lies in plot III.G.1, his comrades in III.G.2 & 3. George is remembered on his parents grave in Newtown Road Cemetery was well as on Panel 3 of the Newbury Town War Memorial. 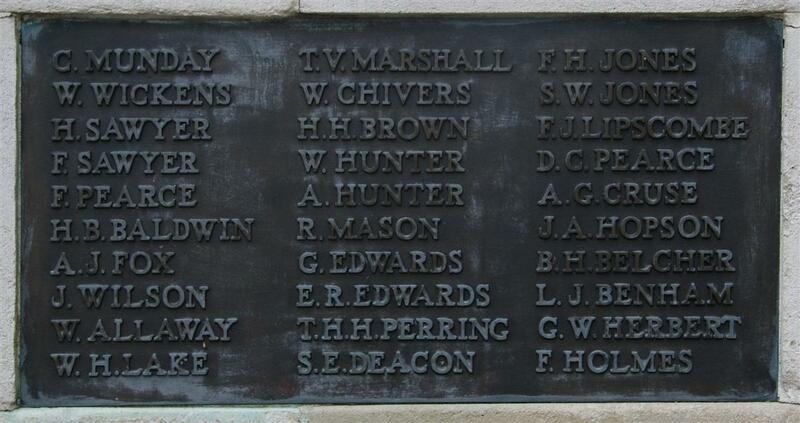 The brother who passed on the sad news, Ellis Russell Edwards died a few months later in December 1917. Newbury Weekly News, 8 July 1920 - In Memoriam. 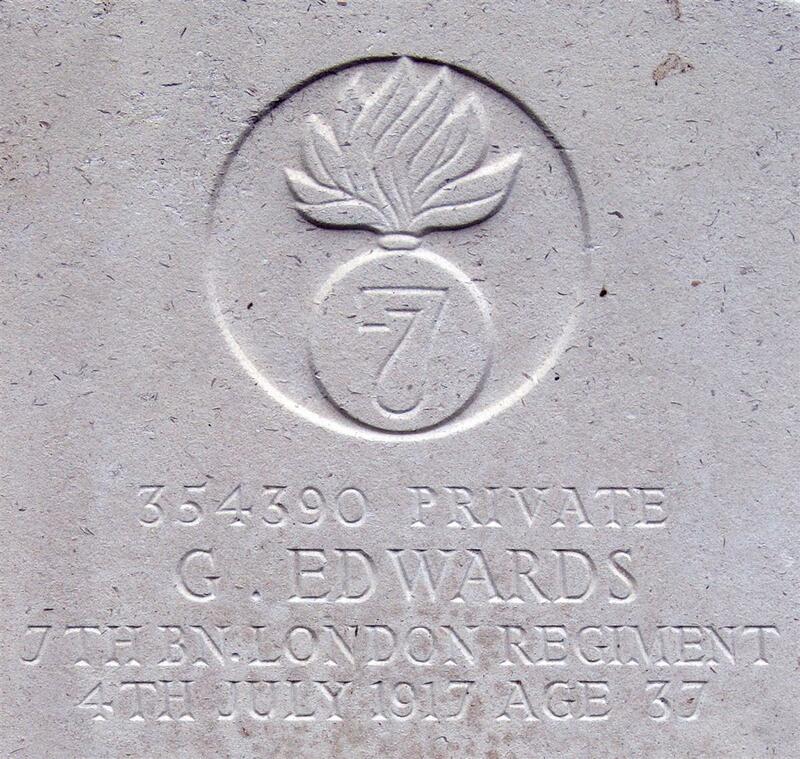 EDWARDS - To the dear memory of a loving brother, George Edwards, third son of Mr and Mrs Edwards, Wash Common PO, murdered by the Germans in France, July 4th, 1917, aged 36 years. But what I think of him. From his broken-hearted sister, Sis.